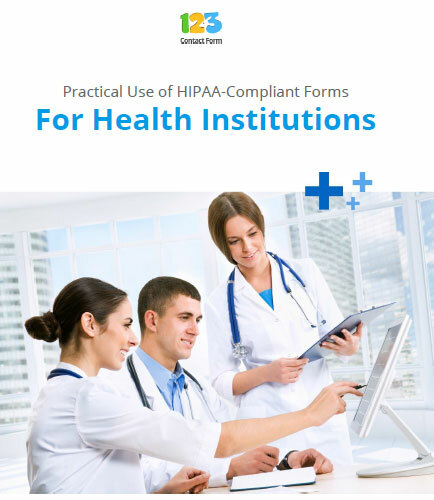 "Practical Use of HIPAA-Compliant Forms for Health Institutions"
HIPAA allows a transparent and secure management of PHI, reducing health-care abuse and fraud. Complying with HIPAA and putting your patient forms online is a top priority for health Institutions to keep patient's private information safe and secure. The best solution is relying on a solid and trustworthy HIPAA-compliant platform, which centralizes patients’ private and sensitive information, by following the procedures that ensure confidentiality and security when receiving, handling, transferring and storing PHI. Why do health institutions need a HIPAA -compliant data solution? My clinic is not in the USA, why are HIPAA -compliant forms relevant for me? What are the benefits of automated online processes for your health institution? What are the top inefficient processes for health institutions? How 123contactform addresses the most important issues for health institutions? What is HIPAA Compliance ? HIPAA Compliance is a set of laws and protocols that ensure the protection of private information stored by healthcare clinics or hospitals on networks. Firms that deal with electronic protected health information (ePHI) and Individually Identifiable Health Information (IIHI) has to follow the terms and regulations standardized by the HIPAA compliance, with the aim of protecting the privacy of patients.